Especially for winners of the cook off, Chef Raymond Haymes and Paul Fedj of Churchill Natural Meats who took home the coveted BEST SLIDER trophy. 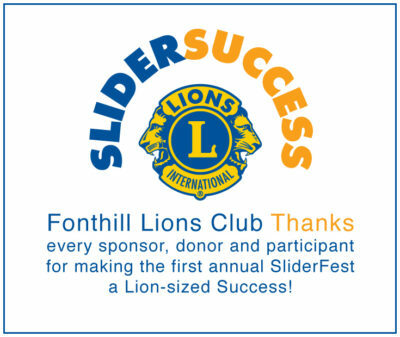 The sun shined down upon Pelham’s first ever local slider throw down, hosted by the Fonthill Lions Club to fund raise for their community service. Attendees at the event savoured delectable slider recipes ranging from Chef Haymes’ winning Chipotle Cheddar Bison Slider with double smoked wild Boar Bacon to Iggy’s Pub’s BBQ Beef Brisket Slider with horseradish cream, caramelized onions topped with a dill pickle. The Chef Team at Lookout Point Country Club served up a Fennel Maple Smoked BBQ Pork Belly with special cider apple slaw while Pub on the Hill presented a Red Wine Braised Pork Belly Slider, served with Brie and sweet red pepper relish. Zest Kitchen offered up a Cumbrae Farm ‘Hog Burger’ Slider, with Fenwick peach & corn relish, Kozlik’s mustard aioli and Rumar farm lettuce. The event was held at the Fonthill Lions Club, GL Klager Park on Saturday August 26th, 2017. Presenting sponsor was Pen Financial Credit Union with Enviro-Niagara Hearth & BBQ as Grand Prize sponsor donating a Traeger Pro Series 22 Wood Fired Grill BBQ. The $30 entry ticket entitled attendees to one of each five sliders from competing chefs as well as fresh cut fries and corn served by the Fonthill Lions and a soft drink. All the corn for the event was donated courtesy of Bry-anne Farm. Music filled the air with afternoon blues from The Backyard Two-Fives and evening headliner The Rhythm Hounds. About 430 people attended SLIDERFEST 2017 which was originally intended to be a 300 person event. “Ticket sales took off like crazy and we were suddenly sold out. It was a shame to have to turn people away but the chefs had limits with the last minute surge in sales” says Fred Arbour, Fonthill Lions Secretary and Chair of Region 38 of Lions International A-2 District. Concept to the actual inaugural event was incredibly accomplished in just over 10 weeks. The Fonthill Lions are the originators of the Lions International slogan “We Serve” and continue to demonstrate their ability to do so on even the shortest notice.